Two weeks ago, we were chatting about Stove-Top Chicken and Vegetable Noodle Soup and 90 degree winter temperatures (at least in Florida). Today, we’re grilling burgers and it’s 30 degrees in Florida. Oh, the irony. Last week I shared one of my favorite go-to dinner meals: Chipotle Blue Cheese Burgers with Mushrooms and Onions. If you haven’t made those burgers yet, what are you waiting for?? You need to make them ASAP. Even if the temperature outside is just too cold for lighting the grill, go with the stove-top method. Along with sharing a real food burger recipe, we also chatted about how to “real foodify” burgers. You know, the process of turning processed junk food into a meal that actually possesses nourishing qualities. To make our burgers “real food worthy,” we swapped out the conventional, corn-fed beef for pasture-raised beef (AKA: grass-fed beef). The mystery mayo (if you’re a mayo person) was replaced with homemade mayo or a cleaner store-bought brand (like Primal Kitchen or Sir Kensington’s). The burger was loaded with fresh ingredients, similar to building a salad: real cheese, arugula (or lettuce or spinach), mushrooms, onions, and/or anything else your real food lovin’ tummy desires. 1) Do without the bun: There are many times when I simply eat my burger with a fork and knife. 2) Go with a cleaner bun: There are a few cleaner store-bought buns sold in health food stores these days. My favorite brand is Silver Hills Sprouted Bakery. 3) Make your own bun: Looking for a good bun recipe? You’re in luck! Today we’re going to make one. Actually, not just one, but a dozen homemade buns to be exact. 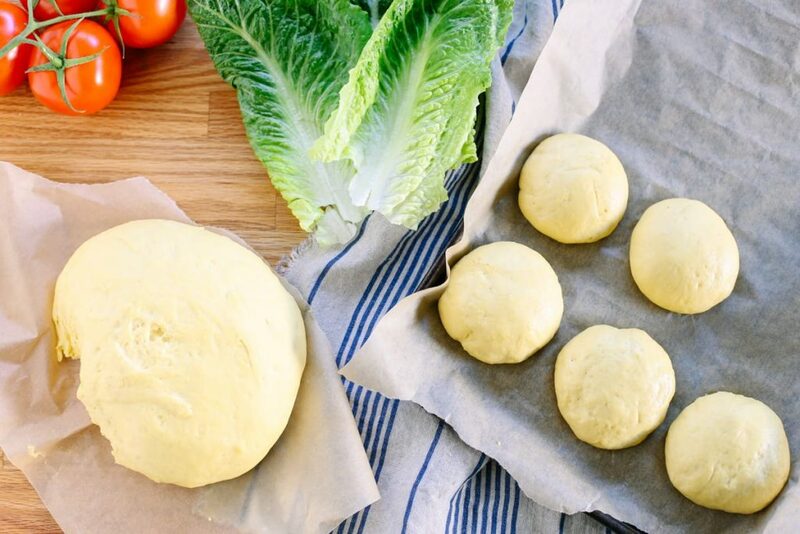 Making homemade bread sounds complicated enough, but homemade hamburger buns? Talk about a complicated endeavor. Trust me, I voiced that exact same concern for many years, but the truth is that making homemade buns is really easy. I know, I say that about everything on this site, but that’s the goal around here: simple real food and natural living. Ain’t nobody got time for complicated! <—Thank you, Facebook for entertaining memes and new phrases ;). Despite the long directions (below), which are meant to be very thorough, the most complicated part about making homemade hamburger buns is just the patience required to wait in between dough rises. So if you can muster up the patience to wait for the dough to rise, you can and will successfully create the most amazing homemade hamburger buns. Buns that are fluffy and light, naturally-sweetened, 100% real, and even nourishing. I know, they sound too good to be true, right?! They exist, friend, they exist!! 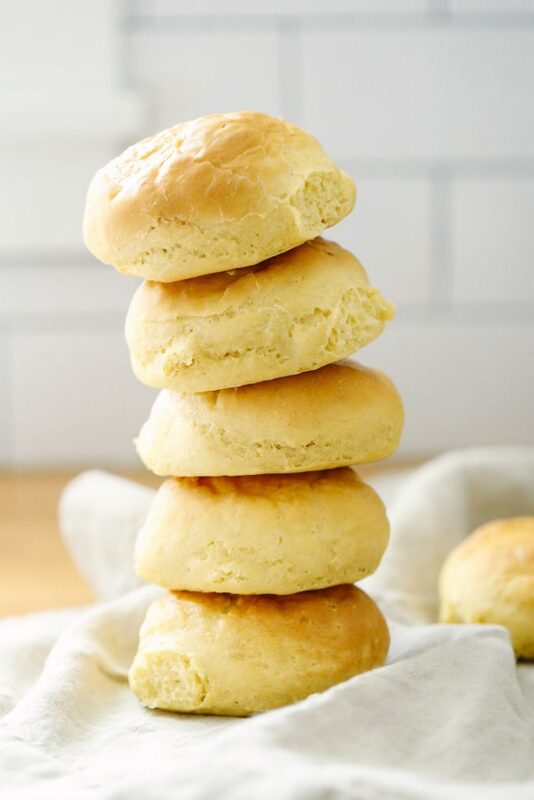 To help with the patience part, and to help get dinner on the table in a timely manner, I recommend making homemade buns in advance on the weekend or during your prep time. Since my recipe makes twelve buns, you can make the buns in advance, freeze the baked buns, and pull out as many as needed for a quick and easy dinner (or lunch or breakfast…no judging here). 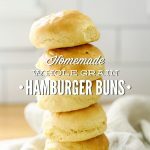 My homemade hamburger bun recipe also works very well for sandwiches in general, so don’t feel like you must fill the buns with just hamburger patties. The sandwich options are unlimited. 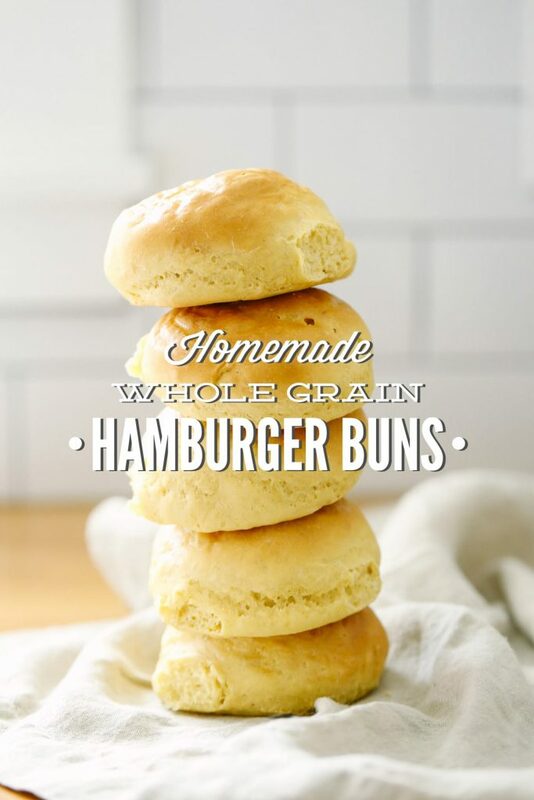 Let’s start baking and enjoying the best homemade whole grain burger buns ever! 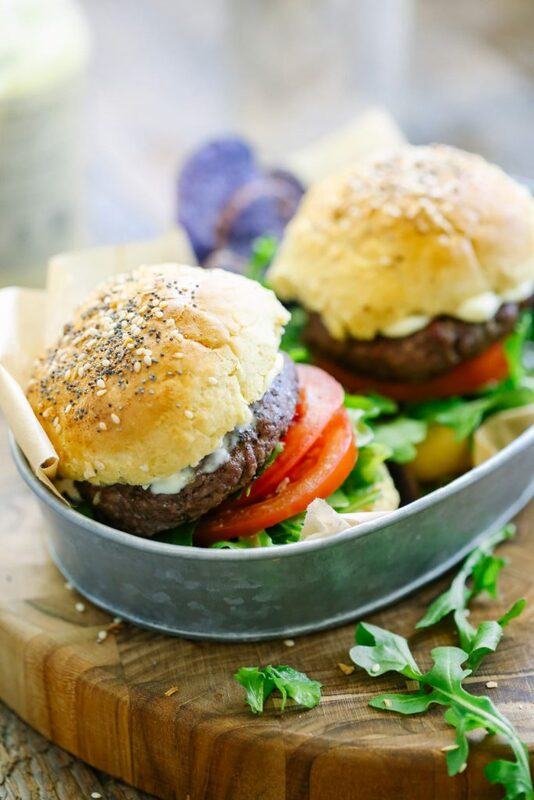 ...you can and will successfully create the most amazing homemade hamburger buns. Buns that are fluffy and light, naturally-sweetened, 100% real, and even nourishing. I know, they sound too good to be true, right?! They exist, friend, they exist!! Warm the milk and water. The liquids should be warm, but not HOT! 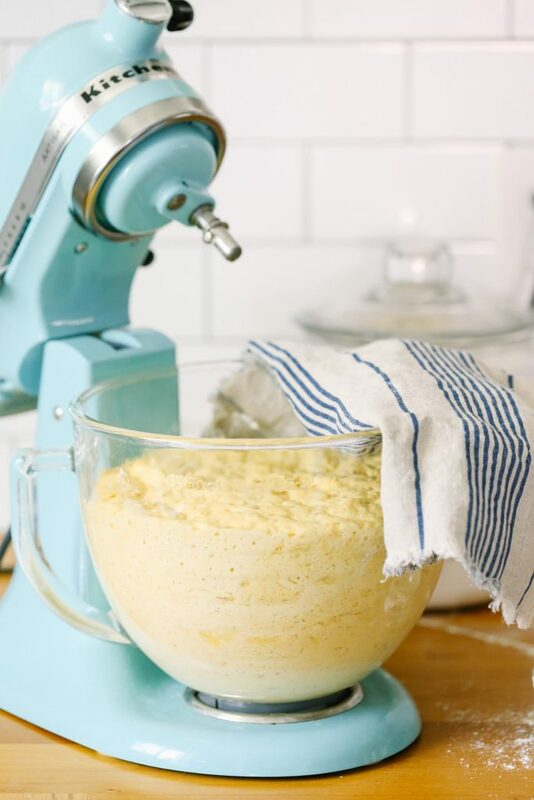 In the bowl of a stand-mixer (or a large bowl), whisk together the warm milk and water and the yeast. 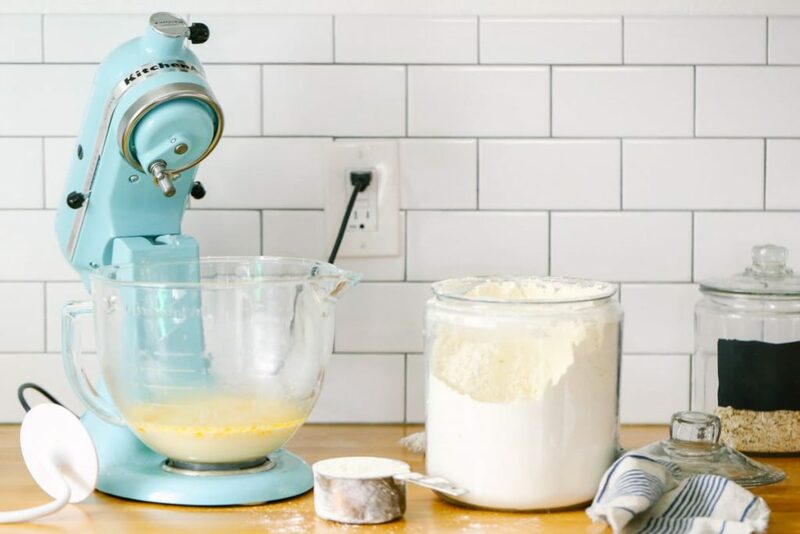 A whisk or fork is fine, there's no need for the whisk attachment on a stand-mixer for this recipe. Let the yeast proof for 5-10 minutes in the liquid ingredients. After 5-10 minutes, the liquid should appear to have a foam layer on the top. Whisk the oil, honey, eggs, and salt into the yeast mixture. Add 2 cups of Einkorn flour, and turn on the mixer, fitted with the dough hook. If you don't have a stand-mixer, use a wooden spoon. On low speed, using the dough hook, mix the flour and liquid ingredients. As the flour begins to incorporate into the liquid, add the remaining flour one cup at a time, until you reach a total of 5 cups of flour. Do NOT add the remaining 1/3 cup at this time. Einkorn doesn't like to be kneaded for a long time, so just knead the dough until the flour is combined with the liquid ingredients to form a sticky dough. Do NOT over-mix. Once combined, cover the bowl with a towel and let the dough rest for 1 hour. After an hour the dough should double in size. Sprinkle the remaining 1/3 cup of flour over the sticky dough. Using your hands, combine the flour with the dough, forming the dough into a ball. 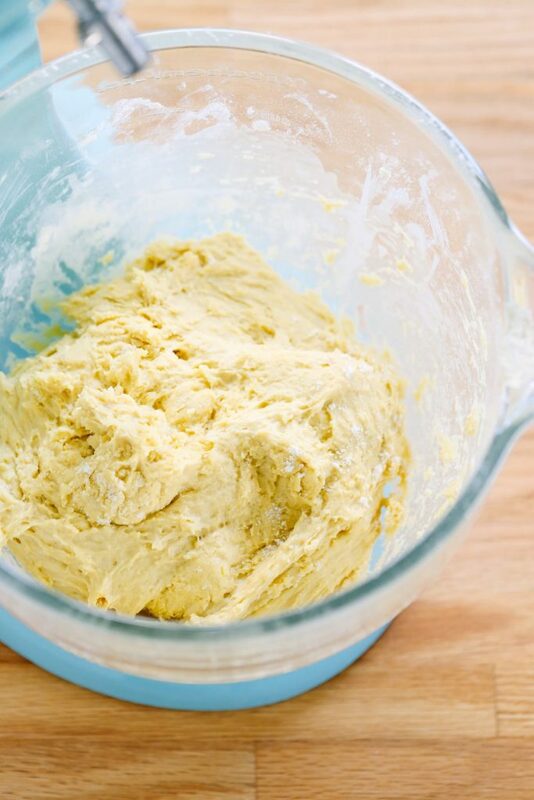 Coat your hands with a small amount of oil to prevent the dough from sticking to your hands. 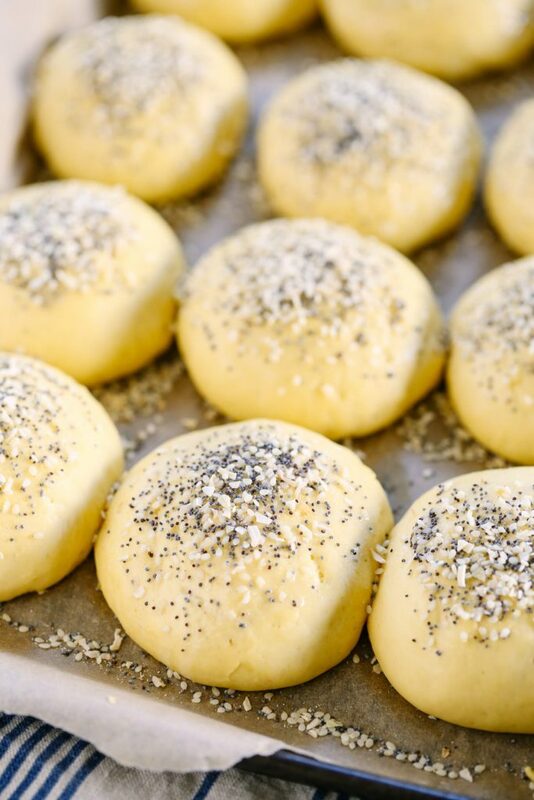 Pull small amounts of dough away from the big dough ball, forming the dough into round buns. Place the formed buns onto a parchment-lined baking/cookie sheet. The buns can be close together, but shouldn't touch. I don't like to use my baking stone to bake hamburger buns, because the bottom of the buns get too "crispy." Cover the buns with the towel for 20-30 minutes, until doubled in size. Preheat the oven to 400F. Prepare the toppings by separating the egg white from the yolk. You'll just want the egg white to brush the tops of the buns, so you don't need the yolk. (optional) In a small bowl, mix together the spices: minced onion, poppyseeds, sesame seeds, and garlic powder. Alternatively, just use sesame seeds or no spices at all. Once the buns are doubled in size, brush the tops of each bun with a light coat of egg white and, if using, sprinkle the spices over the top. Bake the buns for 20 minutes, until the tops are golden. Allow the buns to cool before slicing. Flour Note: I use a scoop-and-level-off-with-a-knife method for measuring flour, so the flour is very compact within the measuring cup. The final dough should be sticky, but firm enough to easily handle and roll into buns. If your dough is very sticky after adding the remaining 1/3 cup of flour, add a bit more flour (a tablespoon at a time). Einkorn looks and tastes similar to white flour, so it’s the perfect healthy flour to use when making soft, fluffy bread or hamburger buns. Einkorn is sold in some health food stores and online. Any idea if this would work with full-fat coconut milk instead of cow’s milk? Hey Danielle, I’m not 100% sure, but I can’t think of any issues with using full-fat coconut milk. The only difference may be a slight coconut flavor–which could be amazing! I bet an unsweetened almond milk would also work. First, I would like to tell you that I love your blog. Great food recipes and the homemade cleaning and beauty products are to die for. I actually switched out most of the commercial cleaners and beauty products to homemade thanks to your posts. I do have a question. If I use whole wheat pastry flour instead of einkorn, do I still use the same amount? Hey Zsuzsi, That’s so great! 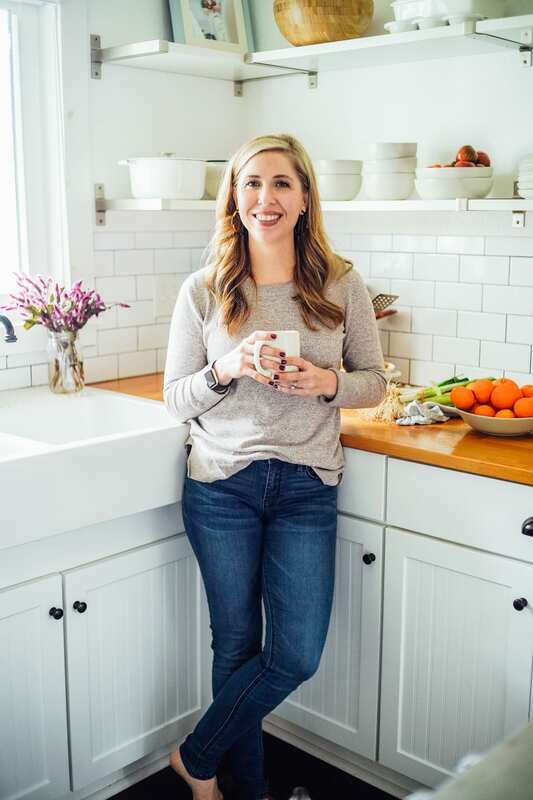 I’m so glad you’re enjoying the recipes on Live Simply!! I’m not sure about whole wheat pastry flour as a substitute for the einkorn in this recipe. Einkorn reacts differently with kneading and liquid absorption than other flours. I recommend eyeing the recipe, sticking with the liquid amounts, and adding flour only until you notice the dough looks sticky (like the photos above). Then adding more flour, if needed, after the first rise. The flour amounts will probably be similar, but I’m not sure if they will be exactly the same as the einkorn amounts. The whole wheat pastry dough may also need to be kneaded for a bit longer–einkorn doesn’t like to be kneaded. Thanks as usual for making it seem so easy! Hey Veronkia, I’m not sure about all-purpose flour as a substitute for the einkorn in this recipe. Einkorn reacts differently with kneading and liquid absorption than other flours. I recommend eyeing the recipe, sticking with the liquid amounts, and adding flour only until you notice the dough looks sticky (like the photos above). Then adding more flour, if needed, after the first rise. The flour amounts will probably be similar, but I’m not sure if they will be exactly the same as the einkorn amounts. The all-purpose dough may also need to be kneaded for a bit longer–einkorn doesn’t like to be kneaded. I love this recipe! My children are so happy to have hamburger buns again! Thank you! Yay, Jessica! I’m so glad your kids are loving the burger buns!! Can you give me approximate size of dough balls? Like golf ball size, or larger? I’m going to try and find this flour this weekend, if not I’ll order on line. Thank you for such yummy recipes and the full instructions. Hey Trisha, The balls are a little bit larger than a golf ball. You’ll want to have 12 equal-size parts from the large ball of dough. Enjoy!! Hi!! I made these with whole grain einkorn flour and I reduced the flour by 5% since I was switching but they still didn’t puff up like yours. Can you suggest anything else I can do so I can keep these as whole grain? They were kind of flat lol Thanks!!! Hey Qmy, I would keep the flour amount the same. Was the dough really sticky with the reduction? Also, by chance were you using freshly ground flour? My other thought is to try a different yeast–that sounds like the big factor. This is my absolute favorite yeast: http://amzn.to/1pZUjTY. One more factor may be the outside temperature during the rise. A yeast bread likes a nice, warm environment. Hi! Yeah. I use only freshly ground flour Would this negatively affect anything? I have been using red star yeast, and my dough was in a proofing box at 81 degrees Fahrenheit. It was a little sticky but not too much. Thanks for letting me know. Hey Amy, Yes, then I think it must have been the flour. Freshly ground einkorn and store-bought einkorn often produce very different end products. Many times, I actually need more freshly ground flour. I’ve noticed that this happens with a number of whole grain fours. My family and I just tried your burger buns and we love them! Thanks so much for the recipe!! Hi! Just what I was looking for, a whole grain hamburger bun recipe for einkorn flour. However the title says whole grain but the recipe says all-purpose einkorn flour. Typo? I grind my own from einkorn wheat berries, and most recipes using that call for more flour than recipes calling for all-purpose. Could you clarify? Hey T-Stew, Nope, not a typo. All-purpose einkorn is not 100% whole grain (as in nothing is removed), but it is still a whole grain flour–just a small amount is removed. It isn’t stripped, bleached, etc. like an all-purpose white flour. You could definitely use 100% whole wheat einkorn (nothing at all is removed), but you’ll need to adjust the flour amount slightly. If you’re using freshly-ground einkorn, you’ll need more flour. I’m not sure about the actual amount needed–you’ll need to just watch the dough, adding more until you reach the dough consistency. I don’t usually put comments on blogs but I had to add my thoughts. This recipe was fantastic! 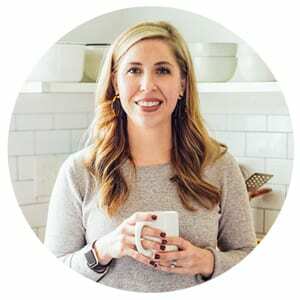 I’m new to the Einkorn world and my experience with past recipes has been good, but not great. Nothing quite tasted as good as the typical white flour version. This one changed everything! I will be making this again :-). Thank you! Thank you so much for sharing, Fiona! I’m so glad you’re enjoying the flour and buns!